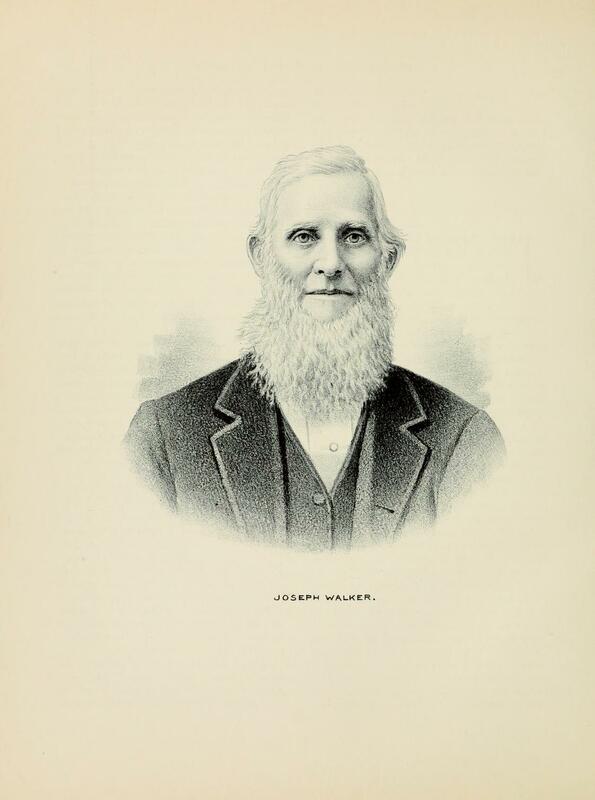 JOSEPH WALKER. Although our subject makes his residence in the town of Windsor, Shelby County, and thus enjoys the advantages of town life, he is actively engaged in farming. Mr. Walker is an omniverous reader, and being a thoughtful man who judges and weighs for himself, he has the advantage of some of his fellow-men, whose views of general matters and current topics are only those of someone else. Original to a refreshing degree, our subject is very pronounced in all his views. He is a progressive man although not readily attracted by every new idea that for the moment is paramount, being practical in all his affairs. The original of our sketch was born in Fayette County, Ohio, March 10, 1814, and thus it is seen that he had lived a long and eventful life. The early part of his life was spent in the woods during which time he was engaged in dealing, and in his native county, and he repeated the same experience in Fayette County, Ind., where he went when about nine years of age. In 1887 he came West and spent two months engaged in trading, visiting different parts of what was then considered the far West. At the end of that time he returned to Fayette County, Ind., and launched into the business of buying and selling cattle and hogs, finding his market in Cincinnati. They were not shipped as now, by rail, but our subject was obliged to drive them over the public highway. September 20, 1847, Mr. Walker was united in marriage in Fayette County, Ind., with Miss Sarah W. Dorsey, and with her he began the journey of life, with a realization of the responsibilities that he had taken upon him. By this marriage he became the father of two children, whose names are respectively Sophronia and Amos W. The daughter became the wife of James Hartsel, of Ash Grove Township. Amos W. is a teacher and has attained a wide reputation as an educator of advanced and progressive methods and theories. Mrs. Sarah W. Walker died in Fayette County, Ind., about three years after their marriage and after his bereavement Mr. Walker returned to Illinois and settled permanently in Shelby County, in 1859. Prior to this he had lived here in 1842, but his stay had been comparatively short. In company with another man he had purchased twenty-thousand acres of land in Kansas. In 1866 he settled in Windsor Township and was from that time until 1884 when he removed to the village of Windsor, engaged in farming. He owns about six hundred acres of land in the county and considering his various possessions, must be accounted a wealthy man. Although Mr. Walker is a farmer and has been such for many years, he has never bound himself down to the drudgery of agricultural life, trading in live-stock having been his chief occupation. Politically he is in sympathy with the promoters of the Greenback party. He is highly esteemed in the community of which he is a citizen and his opinions are regarded with a great deal of respect. His portrait is presented in connection with this brief biographical review. Extracted 11 Jan 2018 by Norma Hass from 1891 Portrait and Biographical Record of Shelby and Moultrie Counties Illinois, pages 326-327.